Home » I love lilies…but I love my cat more! Our final Pet Poison Prevention week article is about lilies- one of the most dangerous toxins that cats can be exposed to. Almost every kind of lily is lethal to cats, and there is no safe level of exposure – since cats lick their paws, even walking through a small dusting of pollen that has fallen on the floor, or a bit of water that has spilled from a vase can deliver a fatal dose of toxins and cause a cat to go into kidney failure. That’s why it’s important to keep lilies completely out of your home if you have cats (and your backyard too, if your cats go outside). They are very commonly included in flower bouquets, so shop informed, and if you receive a bouquet with lilies in it as a gift, use it as an opportunity to educate your friends and family, and then give it to someone who does not have cats at home, or bring it to work to brighten up your desk! The most obvious sign that your cat has been exposed to lilies is if you see them licking or chewing them. If you do, bring your cat to a veterinarian immediately, along with a sample of the lilies. Symptoms will worsen as kidney failure develops, and some cats will experience disorientation, staggering, or seizures. 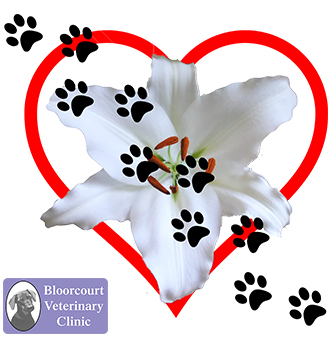 Since lily ingestion can cause acute and irreversible kidney failure, time is of the essence in treating it. Your vet will do lab testing to identify any signs of kidney damage, and will put your cat on intravenous fluids for 2-3 days to flush the toxins from their body and restore their electrolyte balance. If you have any questions, post them below in the comments, or reach out to us at any time! Please share, as not all cat owners are aware of how dangerous these beautiful and fragrant flowers can be.